What the hell is a “jazz jambacore trio”? Why the obsession with piston collars? Then there’s the Rainer Maria Rilke poem (“From infinite longings finite deeds rise…”) And the invitation to contact Guilherme for mojitos and tortillas (he also handles bookings). There’s no doubt that in their packaging’n’promotion, The Rite of Trio are camping in surreal, stream of consciousness territory. I take that as a good sign. Serious Business, as befits the name, sets out the stall. Beginning with a false start (deliberate or just deliberately included, either way there are no accidents) we get busy swinging drums, a groove to move to but not a simple one. After the restart, the bass and guitar join in – a surprisingly overdriven guitar, immediately evoking those 70s prog comparisons. In fact, it puts me in mind of Jethro Tull’s Martin Barre circa “Minstrel in the Gallery” but with a stop-start aesthetic, fluid yet angular. Louro’s bass is pleasingly prominent in the mix, especially in the middle section where a simple four-note riff gathers immense presence and authority, grabbing hold of the ear and whichever part of your anatomy twitches to the rhythm. The drum solo towards the end is notable too. While guitar and bass sit on a single chord, Alves eschews fancy extended technique in favour of just hitting the skins, resulting in a solo more tuneful and engaging than most. This is twisted jazz on steroids, stretched out and exaggerated, then cut and pasted into new shapes until it’s all corners. Grab a Chair, Pick a Card balances a close-to-headbanging riff with a more introspective, sweet & mellow version of itself. Jumping back and forth in a conversation between genres and decades – imagine Kenny Burrell in the room next door to Robert Fripp and you’re part way there. For Slightly Out of Tone, Louro opens with a message in staccato bass Morse as a cymbal wave approaches. When the tide is in, Silva arrives with some virtuosic noodling – nice! The intriguingly-titled Challenging a Jazz Demigod is essentially a 7-minute guitar solo, interspersed with dismissive rantings from the titular demigod (voiced by GON). Kind of one half of a cross-generational cutting contest but we never get to hear the saxophone half. Can’t help but think a version with the sax added would be interesting. The title track is pretty much all the aforementioned ingredients in a single unrelenting showcase… only more dramatic, if that’s possible. And to play us out, The Rite of Trio play cool and minimal, with spare chords accompanying Beatriz Nunes’ intoning vocals. But they can’t play too straight for too long… an atonal edge creeps in, a Tibetan bowl scrapes and sings, and Louro’s arco creates a sinister vibe. When Nunes resumes all is as before but all is different… and then, it’s over. Underneath all the playful games, I get the impression The Rite of Trio are obsessive about details of the music they make, without actually taking it or themselves too seriously. Remember, there are no accidents. And The Rite of Trio have carefully and deliberately crafted an absolutely unique album that defies easy categorisation. Maybe we can just call it ‘jambacore’, whatever that is? 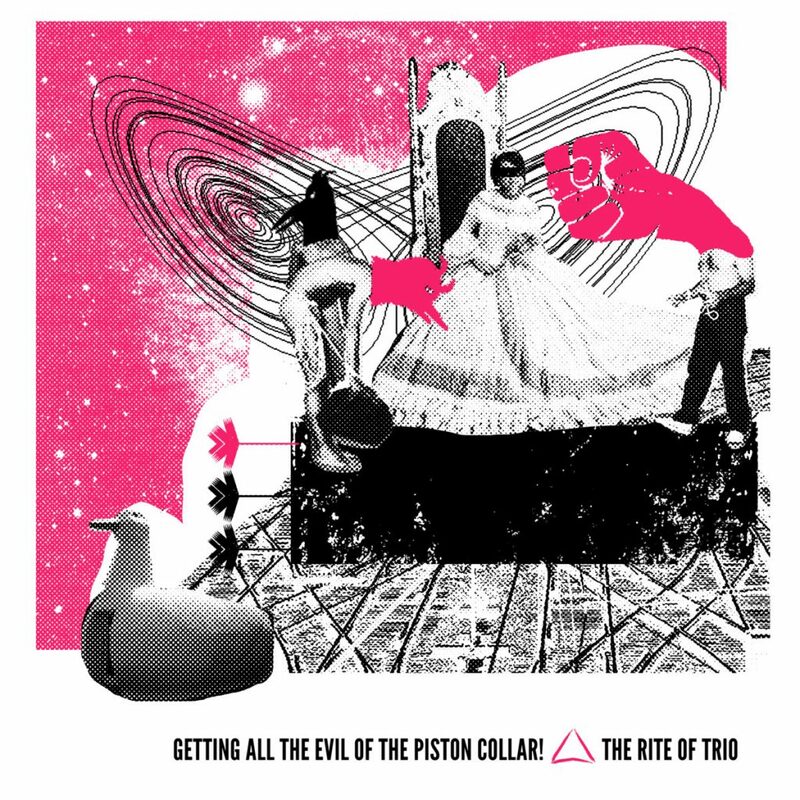 “Getting All The Evil Of The Piston Collar!” is available on CD and download from Bandcamp. 2 Responses to The Rite of Trio – Getting All The Evil Of The Piston Collar!